The Annual Bensen Days fly-in welcomes rotorheads. 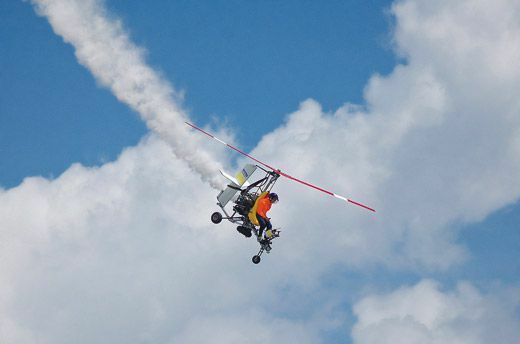 The annual Bensen Days fly-in, held in Wauchula, Florida, and sponsored by the Sun State Wing and Rotor Club, honors Igor Bensen, father of the personal gyroplane, who in 1962 founded the Popular Rotorcraft Association. The PRA now represents 1,600 gyroplane owners, pilots, and enthusiasts across the globe, and plenty of them trailered their craft, stuffed them in pickup trucks, strapped them to cars, or even flew them to the 39th Bensen Days gathering last March. Bensen Days also welcomes powered rotorcraft, parachutes, and paragliders. Today’s gyros are safer and more comfortable than the “hang it all out” designs of Bensen and his contemporaries. Gyroplanes use pusher propeller engines to spin up unpowered rotor blades, which generate lift. Gyros can’t spin or stall, are easily controlled even if the engine quits, and take off and land in just a few yards. Thanks to designers like Ernie Boyette of Rotor Flight Dynamics, gyro engines have been repositioned to provide centerline thrust, and with a horizontal stabilizer behind the engine, they are no longer prone to pilot-induced oscillations. 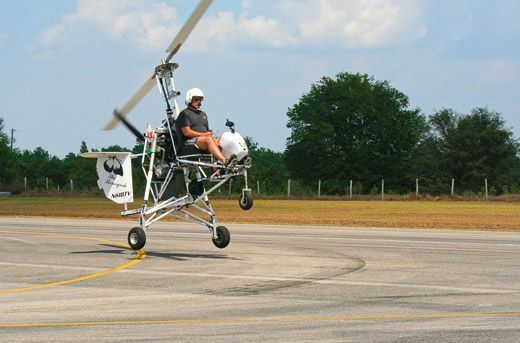 During the festivities, German manufacturer AutoGyro kept its MTO models, sold as experimental in the United States, in non-stop demo and training mode, emphasizing their cross-country transportation capability. Roy Hanan, an MTO dealer whose district is the U.S. southeast, thinks his gyro will be among the first to which the Federal Aviation Administration will grant Light Sport status, which would enable buyers to purchase factory-built gyros Stateside. (When the FAA created the Light Sport category, gyroplanes missed out because the industry couldn’t agree on the criteria for inclusion—along with other controversies.) To compete with imports, Jim Fields of Hastings, Michigan, will soon offer his own kit: a HoneyBee G2 gyro with a full enclosure. Fields also gave rides in the first iteration of his new machine.